Model 1100 © 1947 Wurlitzer (The Rudolph Wurlitzer Co.). 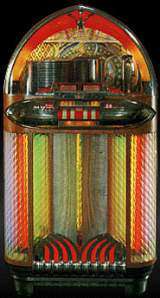 Represents a transition style between the 40s and 50s jukebox styling when the record player area started opening up behind larger glass displays. Heavy use of chrome styling.